Publisher: Hill & Wang, Inc. Country: United States. Date: 1956- .
by Henri Fluchère. Foreword by T. S. Eliot. New York, Hill & Wang, Inc., 1956. Series Note: The Dramabooks series (Hill & Wang, serial numbers D1, D2, etc.) is the sister series of the Mermaid Dramabooks series (Hill & Wang, with serial numers MD1, MD2, etc.). The Dramabooks series publishes criticism on the theatre whereas The Mermaid Dramabooks series publishes reprints of plays. The Paperbound Book in America: The History of Paperbacks and Their European Background by Frank L. Schick, New York, R. R. Bowker Company, 1958, pp. 198-199. D1. 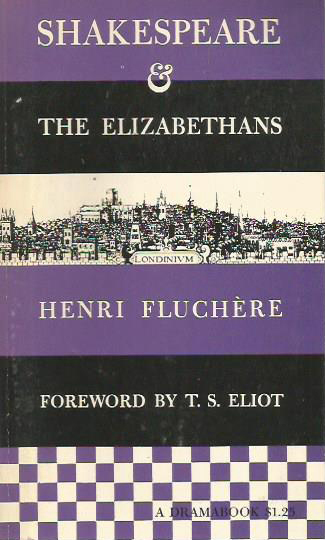 Shakespeare and the Elizabethans by Henri Fluchère. Foreword by T. S. Eliot. 1956. D2. On Dramatic Method by Harley Granville-Barker. 1956. D3. George Bernard Shaw by G. K. Chesterton. D4. The Paradox of Acting by Denis Diderot and Masks or Faces? by William Archer. Introduction by Lee Strasberg. D5. The Scenic Art by Henry James. Edited with an Introduction and Notes by Allan Wade. D6. Preface to Hamlet by Harley Granville-Barker. D7. Hazlitt on Theatre, edited by William Archer and Robert Lowe. Introduction by William Archer. D8. The Fervent Years by Harold Clurman. D9. The Quintessence of Ibsenism by Bernard Shaw. D10. Papers on Playmaking, edited by Brander Matthews. D11. Papers on Acting, edited by Brander Matthews. D12. The Theatre by Stark Young. The Quintessence of Ibsenism: Now Completed to the Death of Ibsen by Bernard Shaw, New York: Hill and Wang, n.d. (Dramabooks, D9).